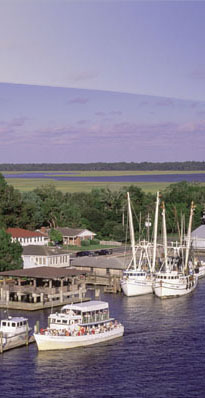 A wonderland of compelling locations, Coastal Georgia serves up verdant marshlands, wilderness islands, the Atlantic Ocean, the Intracoastal Waterway, numerous rivers, the Great Okefenokee Swamp, quaint waterfront villages, small town America, and majestic maritime forests—captivating vistas at every turn. Add in the mystique of historic cemeteries, the charm of antebellum mansions, time-forgotten cultures, and the friendliest people you'll ever meet, and you'll discover the makings of great film. We call it "Cinemagical"! Coastal Georgia offers a rich tapestry of ultra-desirable production values just minutes from Interstate highways and an international airport with big city assets close by and generous State of Georgia tax incentives. Call 912-729-1103 to reserve tickets.